Through out the nineties there was “A Buddhist Vihara for Manchester of Theravada Tradition” interest group emerging amongst a brotherhood of Sri Lankan expatriates living in the North West of UK; especially around the Vales of Greater Manchester. However raising the requisite funds for an abode for the priests was construed as formidable and insurmountable: and at times deemed only possible on the odds of an enthusiast winning the National Lottery! In early 1999 the germ for the creation of the very dream for North West Sri Lankan Buddhist fraternity, a Buddhist Vihara for Manchester was sewn by a retired nurse philanthropist Miss Gammanpilla, offering her residence in Crumpsall for the purpose. Venerable Pidiville Piyatissa was invited to head the mission as the prospective chief incumbent priest. Ketumati Vihara in its vestigial form was inaugurated at 5, Claremont Road in Crumpsal. Venarable Piyatissa’s late guru priest was invited from Thulawala, Lunuwila Sri Lanka to provide the inaugural blessings and oversight at the very inception and the infancy of the Vihara. Ketumati Buddhist Vihara Trust came into existence as a charity registered with The Commissioner of Charities with a Governing Document laying down the primary objects of the Trust and facets of governance. Late Mrs. Jayanthi Wijesinghe a respected lawyer from the Sri Lankan community was instrumental in fine tuning the Trust Deed. When difficulties of running a Vihara with a “gihi contagion” inevitably surfaced, the responsibility of acquiring a suitable residence for the monks replete with calm and tranquillity fell on a group of friends of the Dhamma; led by late Dr Dudley Bandara, a Community Paediatrician from Oldham. Search for a home for the priests(a Vihara), started in earnest. A three-bed semidetached house in Hollins Oldham was chosen for the purpose because of the relative quiet of its surrounds and adequate street parking in its vicinity; at an offer price of £49,500. Since a mortgage could not be obtained; a sum £20,000 was raised in absolute grants, and a further sum of £30,000 was raised as “interest free loans” from a close group of friends of the Dhamma, who under the guidance of Venerable Piyatissa rallied around Dr. Dudley Bandara in this noble venture. In April 2000 the present premises were purchased by the Trust, and the Ketumati Vihara moved to its new abode at 3 Pretoria Road Hollins Oldham. The newly acquired temple premises acted as great impetus for cohesion of the North West Buddhist fraternity not only in the practise of Buddhism but also as place of social interaction and Sri Lankan cultural discourse. With the widely popular Venarable Piyatissa- a Sri Lankan Buddhist priest of Granthadhura tradition at its helm the Vihara drew substantial support and sustenance from all quarters of the North West Sri Lankan community and beyond. With Dr. Sarath Senarath Yapa and Mrs. Nimala Pieris joining the Board of Trustees in the year 2000 as Honarary Secretary and the Honorary Treasurer to the Trust, a major chunk of pressure was taken off the shoulders of Dr. Dudley Bandara who played the unenviable role the main Financier, Secretary, Treasurer and the de-facto Chief Executive of the Trust at its inception. The members of the Trust Board worked with the greatest financial stringency and diligence; and the “in-house” engineers like Dr. Thilak Pieris and Mr. Dayananda Dissanayaka spent their valuable time keeping Vihara refurbishment costs down. 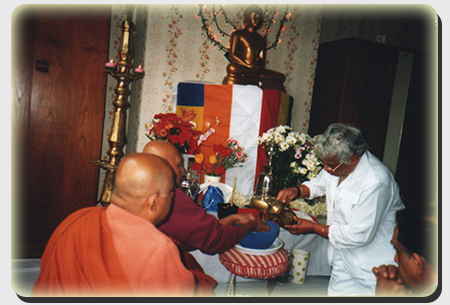 The Board of Trustees met regularly quarterly every year; and the opportunity was given to all supporters and well wishers of the Ketumati Vihara to get acquainted with the working of the Vihara and contribute to fashioning of its functioning and activities in the form participation in an Annual General Meeting convened every year as stipulated in the Governing document. Working full steam as a united team with personal sacrifices of its members; the elapse of the first five years saw the Ketumati Vihara Trust being steered to financial independence with all its debts paid and bringing in regular remittances to cover all running expenses leaving a modest surplus. With finances well bequeathed and the Trust Board fulfilling its obligations to the full, Ketumati Vihara grew contemporaneously to its extant stature as the principal Vihara for the Sri Lankan fraternity of the North West. Close links were forged with the other local Buddhist brotherhoods like the Buddhist Group of Kendal who naturally became a regular component of Ketumati Vihara clientele. Monthly sermons from renowned Teachers of the Dhamma and Buddhist Meditation, a Dhamma School for the children of the North West and beyond, an annual Cultural Celebration of the Sinhala and Tamil New Year in April and the Katina ceremony at the end of “Vassana” towards end of October each year, all have become popular events in the Ketumati calendar. Although remaining outside Trust Board, Mr Anura Wijesiri's contribution to the Vihara as Chief Organiser of all major events was magnanimous and indefatigable. He was very ably assisted by Dr. Deepika Wijesiri his beloved wife. With Mr. Leslie Liyanarachchi joining the Trust Board in the year 2002, the Vihara was blessed with the in house services of an audio-visual engineer and the donation of a new public address system; which was taken for granted as up and running for all Vihara events!. The children of the Dhamma School not only learned basic facets of Dhamma under the tutelage of the incumbent monks led by the Chief Priest; but had the gift of exposure to Sri Lankan cultural aesthetics like Music and folk Dance thanks to the devotion of Mrs. Mallika Liyanarachchi and Sri Lankan Drama, Folklore and Mores and access to costumes thanks to the continued commitment of Dr. Suneetha Perera. The expanding Dhamma School necessitated the recent construction of a spacious conservatory for Ketumati Vihara. Dr. Nilani Gajaweera's (a regular benefactor of Ketumati) financial assitance in this latest acquisition is appreciated with great gratitude. It is a great credit to the to the affability and generosity of Venerable Piyatissa- the Chief Incumbant Priestof Ketumati Vihara, that his devoted Chaplaincy services to the University of Manchester is highly sought after and valued by a multitude of students. Over the past four years The Manchester Buddhist Conference bringing together different sects of followers of Buddhism in and around Manchester has been convened at the auspices of Ketumati Vihara. Dr. Senarath Panditaratne functions as the present Honorary Secretary, and Mr. Dimuth Jayawarna as the Honorary Treasurer. Dimuth with his skills in computer technology has been instrumental in developing and launching the Ketumati Vihara website. He has been ably assisted by Mr. Senaka Perera in this venture. A collection of talks given by ven. Buddhist monks. Mainly these sermons discuss Buddha's teachings on spiritual aspects of ones life. Visit this section of our Vihara to broaden your knowledge on past activities of the Vihara (Newsletters), chantings by respected Buddhist monks and Jathaka stories for Dhamma school kids. Buddha's teachings were originally given in 'pali' and excerpts of them are available with their translations in english.